The Toronto Raptors and Denver Nuggets levelled their respective first-round NBA playoff series on Tuesday. Toronto responded to their game one-loss to the Orlando Magic with a 111-82 victory in the Eastern Conference. 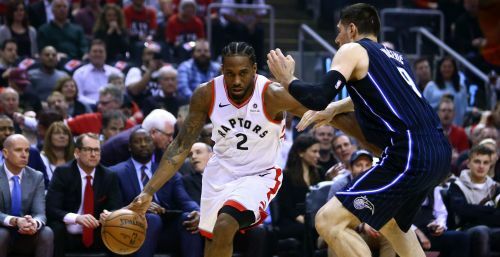 The second-seeded Raptors improved considerably, and Kawhi Leonard was simply unstoppable against Orlando thanks to his game-high 37 points. Aaron Gordon led the overwhelmed Magic in scoring, totalling 20 points while most of his team-mates struggled from the field. Now the series is knotted up at 1-1 as the two squads head to Orlando for game three. Meanwhile, the Nuggets secured a 114-105 win against the San Antonio Spurs in the Western Conference. Beaten in the series opener, the Nuggets rebounded in game two after outscoring the Spurs by 16 points, having trailed by seven entering the final quarter. Four of the Nuggets' five starters scored at least 20 points, and they were led by Jamal Murray, who had a team-high 24. San Antonio will likely make some adjustments to prevent a late game surge in game three at home. The Portland Trail Blazers moved 2-0 ahead against the Oklahoma City Thunder courtesy of a 114-94 win. Kyle Lowry bounced back from a scoreless game one-outing with 22 points and seven assists for Toronto. LaMarcus Aldridge posted 24 points and eight rebounds in a losing effort for the Spurs. Jonathan Isaac scored five points on one-of-eight shooting for the Magic. Rudy Gay scored five points on two-of-nine shooting in San Antonio's loss. The Utah Jazz were blown away by the Houston Rockets in game one. Their defensive strategy to contain James Harden was full of holes. The Jazz will have to showcase some serious adjustments to stop the Rockets from running away with the series.